Canada Says It Has Met Its Goal Of Resettling 25,000 Syrian Refugees : The Two-Way Canada reached the milestone number less than four months after it started accepting Syrian refugees. The initiative was a campaign promise by newly elected Prime Minister Justin Trudeau. 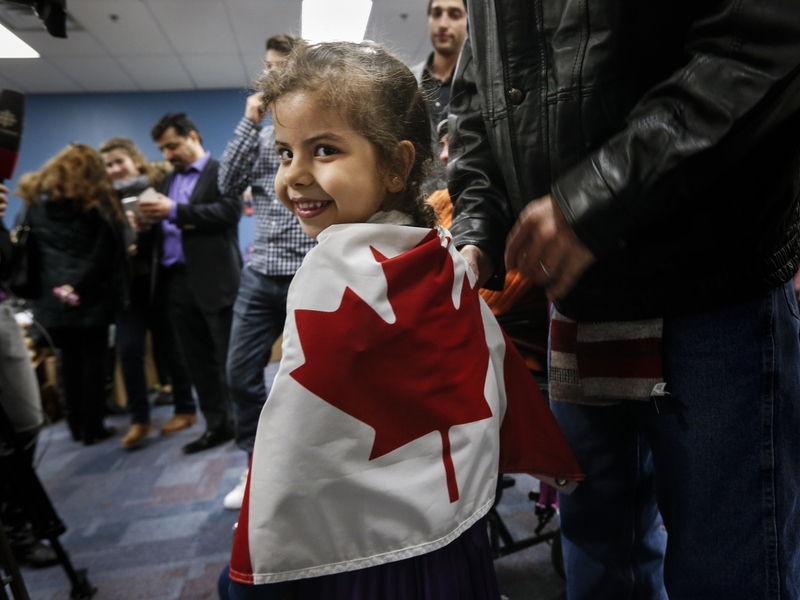 Reemas al-Abdullah, 5, wrapped herself in a Canadian flag before a dinner hosted by Friends of Syria at the Toronto Port Authority in December. Less than four months after it started accepting Syrian refugees, Canada says it has reached its goal of bringing in 25,000 people who have fled the raging civil war. The initiative was a campaign promise by newly elected Prime Minister Justin Trudeau. He personally welcomed the first group of refugees when they started arriving in December. As NPR's Jackie Northam reports for our Newscast unit, "initially, the government wanted to have all the refugees resettled by the end of last year, but logistical challenges — such as medical and security screenings — slowed the process." "Well, 15,000 of the refugees are being sponsored by the government, but what's remarkable is that about 10,000 are being resettled under a private sponsorship program, and it allows private citizens or groups to bring refugees into Canada. ... So we're seeing a lot of church groups and neighborhood groups, PTAs — things like that, all across Canada are stepping up to help in organizing. "They have to make a one-year commitment to help the refugees get settled here, and that includes covering expenses, finding them housing and jobs, getting the kids settled in school. And even though it's a private sponsorship, the government will also help. They'll give the refugees a stipend, they'll get free health care and language lessons and the government will also pick up the cost of travel." Canada's immigration minister, John McCallum, says now that these Syrian have arrived, government efforts will shift to Phase 2: "helping settled refugees find permanent living arrangements, jobs and to get them enrolled into language training for either French or English," according to the CBC. He adds that the program has cost about $522 million so far, which is "under where the budget that we set." "In order to meet the Liberal government's campaign promise of bringing in 25,000 government-sponsored refugees, McCallum said, the federal government will have to settle another 10,000 Syrian refugees, plus some additional private refugees, before the end of the year." The new arrivals are settling in and beginning to find jobs. The Toronto Star newspaper says several dozen of them are working at two branches of a Middle Eastern grocery store in the Toronto area. "This is a very good start. A first job is very important for someone who arrived alone with no money. Thank you for this opportunity. They are saving lives," says 26-year-old Marah Khanjian, from Aleppo, on her first day at work. "Applications to sponsor Syrian refugees have been pouring in since early September, when a photo appeared of a lifeless 3-year-old boy whose body had been swept ashore at a Turkish beach. Alan Kurdi's parents had applied to Canada for asylum, but the request was turned down." This comes at a time when many countries, especially in Europe, are shutting borders or putting caps on the number of migrants they can take. The U.S. has pledged to bring in 10,000 Syrian refugees this fiscal year — which has faced pushback from some lawmakers. According to data from the Worldwide Refugee Processing System, 950 Syrian refugees have arrived in the U.S. so far this fiscal year. And 2,819 have arrived since Syria's civil war began five years ago. McCallum said he thinks it's important for Canada to send a message to the world, according to the CBC. "We are among the few countries who are saying, 'No, come on in, we want to welcome 25,000 quickly. ... It's important that we're helping 25,000 have a happy and productive life in Canada."